Life after the boat...I wish I had a dime for every time someone asked me... Do you miss the boat? My answer is mostly yes because it was a fantastic lifestyle. And it had to be healthy breathing fresh air 24 hours a day seven days a week. The things I don't miss, are due to boat maintenance, and the fact that I'm 66 now. 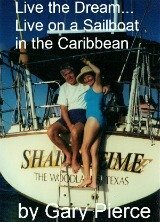 I was 49 when we embarked on our eight year sea adventure. I am not so sure that I want go up the mast 52 feet above the deck in the flimsy bosun's chair that we had the use... To change a lightbulb and such. We also had to do the teak every year (sanding,taping it off ,and reapplying a fresh coat or two of varnish) no problem in Venezuela or Trinidad where we can get cheap labor. A real pain when you had to do it yourself. Am I getting through to you, the importance of retiring young. You retire young and do the things that you want to do, while you are physically able to do them. The financial planning industry will never remind you of the fact that you are swapping time for money. 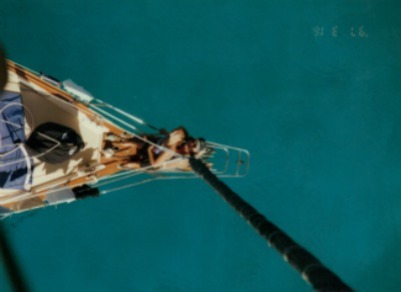 What does the deck of your boat look like from 52 feet? This is what my brother-in-law and his girlfriend look like when I am at the top of the mast. He is 10 years younger than I am, why am I up there and he's down there with a cold beer in his hand? Moral of the story, if you're thinking about sailboat cruising... Do it now. Do you hit the golf ball further now than you did 10 years ago? Is your tennis serve faster now that was 10 years ago? Did you...I am not going there, you should have a picture by now. Why did we sell the boat? Sometimes I wonder...I remember when we left the boat in may of 2002, we had every intention of returning to the Virgin Islands that fall. We agreed that if we got our price on the boat, we would consider selling it. You guessed it, some ruthless so-and-so met our price... Exactly what we paid for the boat eight years prior. Fast forward to today, 2012, Shadowtime is for sale in England, at you guessed it again exactly what we paid for it exactly what we sold it for 10 years ago. It wasn't that we were tired of the lifestyle, but we were enjoying RVing, or land cruising, which we had done in the summertime for the last four years of our boat life. So it was a simple matter that we did get our price and so we sold the boat... Don't you hate it when someone actually meets your asking price? That is what you call a boat owner after he sells his vessel. I heard another cute term, "clods", or cruisers living on dirt...so on land there is life after the boat. Is another boat in our future? Only if I hit the lotto... And I don't play the lotto. But we both miss the great time that we had... Nothing can take those eight wonderful years away from us. Instead of getting up with the sun, have a cup coffee, and reading books...I now get up and at the gym at 5 AM, work on my websites, and play golf three times a week. Julie is active at church, a hospice volunteer, and a local legend at the Goodwill store. She is there when it opens at nine o'clock on Thursday, where they have dollar day... What she doesn't get for us, we by for a friend who has a mission in Mexico... Those cheap clothes fit somebody. So yes there is life after the boat...and it is all good.